Do we still need to mind the MPG gap? The gap between official miles per gallon and real world mpg has grown to 22%. This is up 5% since we first started testing fuel economy almost three years ago. The average official combined miles per gallon of the 459 passenger cars we have tested is 57 and this is increasing by approximately 1.7 mpg per year. 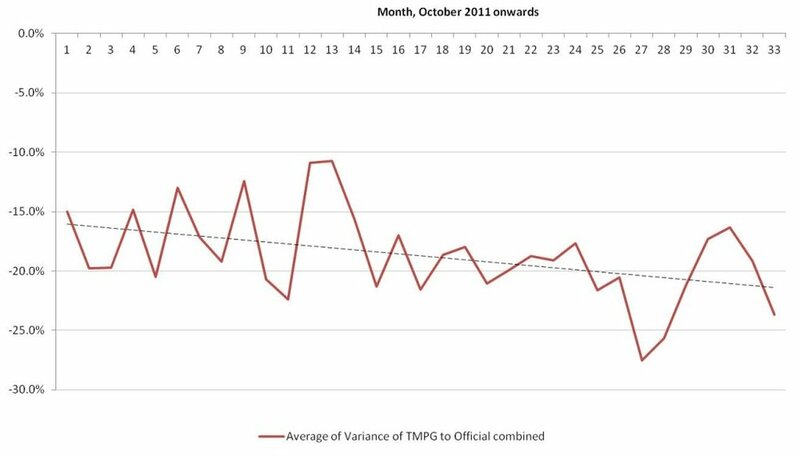 Real world miles per gallon (TMPG) on the other hand, which averages 44 mpg, remains flat thus causing an increase in the gap of about two percentage points each year as can be seen in the graph below. The graph below shows that broadly speaking the gap grows as the engine size reduces. If you buy a five litre car you will not get great mpg but at least it will be consistent with the salesman’s patter and most likely your expectations. However, if you are shopping for a frugal run-around you are better off looking at the one to three litre engines which give the best absolute performance as well as a lower divergence from official figures than the super minis. Our data also shows that petrol engines, as expected, have worse fuel economy than diesels but interestingly the gap to official is also larger. And, manuals return a better fuel economy than automatics but automatics have a smaller gap between official and real-world figures. We’ll be looking at MPG in more detail in next month’s newsletter, including an analysis of the manufacturer leader board. The published results will be anonymised but OEMs are welcome to email me if they would like to find out how they sit within the table. Do eco tyres really save you money? Preliminary tests have shown that ratings on tyre labels are not telling the full story. At mid-range speeds, an F-rated tyre performs as well as a B-rated tyre for fuel economy. We tested two contrasting sets of 175/70 R14 tyres on the road. One set was a standard tyre with B-rating for fuel economy and the other had an F-rating. The test route incorporated a range of steady-state speeds from 40mph to 70mph on tarmac in consistent ambient temperatures. The B rated tyre was superior in the 40-70 mph range by an average of 3.8% mpg and 3.4% less CO2. There isn’t much in it at the mid-range speed but a performance gap opens up at 55mph and by the time you get to 70mph the fuel economy has improved by 12.9%. Thus a consumer buying B rated tyres is unlikely to notice a fuel economy benefit if the journeys they customarily make are mainly urban. Whereas a consumer heading up and down the motorway each day should enjoy an improvement. Now this was an unashamedly quick and dirty investigation but it does demonstrate that the relationship between rolling resistance and fuel economy is not linear and that to bring real improvements to the way tyres are bought and sold manufacturers need to adopt more sophisticated models. The current tyre labelling system, made mandatory by the EU in November 2012, is not working. In a report compiled by the National Tyre Distributors Association (NTDA) and LANXESS, the manufacturers of high-tech rubber for tyres, it was found that one year on 93% of tyre retailers said customers never or only occasionally requested information on the label and only 30% knew that tyres affect fuel consumption. We think manufacturers need better models to translate rolling resistance calculations into fuel economy effects. Improved, independently verified testing and labelling, perhaps with a monetary quantification of the typical benefit would provide a tangible benefit that the consumer would welcome. In the press last week was the news that the European Commission has launched legal proceedings against the UK for failing to deal with air pollution. Britain was supposed to meet EU limits set out in the Air Quality Directive by 2010 but the government has said these levels will not be reached until 2020 in most areas and in London it is likely that they will not be met until 2025. The main cause of these air-borne contaminants regulated by the EU is diesel engines, but why is Britain so far from the target? Although auto manufacturers have introduced a number of modifications to meet the ever tightening controls of NOx emissions, a study conducted by Imperial College London and Emissions Analytics, on Euro 5 light-duty diesels, shows the real-world figures exceed Euro 5 standards threefold in most instances. In the graph above you can see that all the cars in the sample failed to meet Euro standard 4 or 5 and, only three reached Euro standard 3. It can also be seen that the real-world average NOx emissions is considerably higher than the limits set out in the regulations. This is the same situation we see with fuel efficiency when we measure cars for True MPG, comparing their statutory mpg figures to performance in the real world. However, due to high levels of NOx being produced during stop-start driving, such as in traffic, the resulting gap between regulated and real-world air pollution is even more pronounced. The reasons for Britain breaching EU regulations are many and complex; both NOx and miles per gallon standards are calculated using the New European Drive Cycle, the shortcomings of which have been widely reported and are supported by Emissions Analytics’ large volume of real-world data. Others have voiced concerns regarding the number of monitoring stations and the use of modelled data in EU Air Quality Directive compliance assessments. What it is clear is that real-world data has an important part to play in policy making. With the introduction of Euro 6 demanding a drop in NOx of 80 per cent on the previous standard, EA and Imperial are continuing their study to see what the impact of this new ruling will be. Emissions Analytics is also developing a new traffic simulation model which will calculate the effect of speed and congestion on fuel economy, as well greenhouse gas (CO2) and air pollution (NOx and CO) components underpinned by the data from its real-world test of more than 400 models of passenger car. The average MPG was 44.5, with the worst just 20.5 and the best 71.7 (a hybrid). Merry Christmas and a Happy New Year from the Emissions Analytics team. There are two types of diesel particulate filter (DPF) regeneration which can occur without external intervention by the driver or a mechanic. The first is passive regeneration which happens when high exhaust temperatures reached during intensive use (normally either long spells of motorway driving or hill climbing) automatically burn off the trapped diesel particles. The other is active regeneration of the DPF where the ECU is programmed to initiate post combustion fuel injection to increase the exhaust temperature and burn away diesel particles when the filter becomes around 45 per cent full. If either type of regeneration occurs whilst we are conducting an on-road emissions test we have to scrap the test and start again. So, we keep a careful eye on the exhaust temperature, which we measure using our PEMS equipment, to monitor spikes which indicate regeneration. As a result of this process we have recorded the regeneration activity, in terms of both occurrences and emissions output, and the results are not what you might expect. One thing we have noticed is that regeneration will often happen after the extra-urban phase of the test, during the urban phase. Thus the opportunity for passive regeneration has been missed and active regeneration takes place instead. Why does this matter? Well, firstly there is the cost to the operator as active regeneration requires the engine to work harder to reach the required temperature and this reduces fuel economy by as much as 5mpg. But not only that, as can be seen from the graph below, active regeneration has a significant and negative impact on NOx emissions. NOx, a major source of air pollution, can as much as double during regeneration due to late fuel injection and increased engine temperatures. If this happens in town and city environments rather than on the motorway, it could have an even greater negative impact on human health. Although it should be noted that the negative effective of the rise in NOx is offset somewhat by the primary NO2 reduction the regeneration is designed to achieve. Another observation on active regeneration concerns the new cars we test. Because every vehicle What Car? receives to test drive and review is passed to Emissions Analytics who then tests it to record the data which powers True MPG, many of the cars we are testing are very new, with only a few hundred miles on the clock, if that. Yet we are finding that active DPF regeneration can on occasionally take place during the course of the urban phase of our test. It is unlikely that the DPF is 45 per cent full on such a new vehicle, so what is the trigger for regeneration? We haven’t found the answer to this yet, so if you have any ideas please do get in touch. More still needs to be understood on the impact of DFP regeneration in real-world conditions and Emissions Analytics is working with Imperial College London to provide data and analysis to investigate the subject further. What is clear is that the anomalies described above, combined with the issue of illegal removal of DPFs from older vehicles, means that it is likely that more discussion on this subject will be required in the near future. Please feel free to use or share this information with a credit to Emissions Analytics.